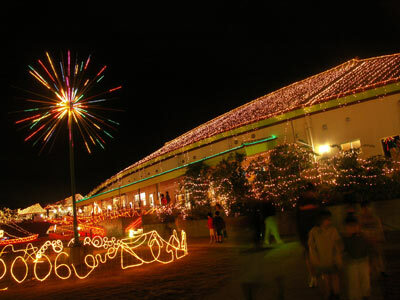 Shimmering holiday light displays are popping up all across Okinawa, adding to the festive nature of the season. 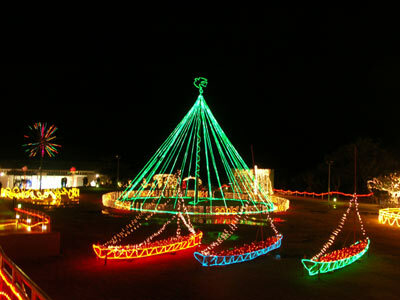 Tens of thousands will be visiting Peace Memorial Park in Itoman in the coming days to partake in the most spectacular holiday lighting display on the island. Now in its eighth season, the Itoman Peace Illumination Celebration kicks off on Dec. 20, and runs thru the New Year until Jan. 3. Festive light displays are illuminated daily from 6pm to 10pm, with more that 650,000 light bulbs twinkling and flashing to the glee of visitors. The Peace Memorial Park display is draped from buildings and also has free standing exhibits. Officials are expecting more than 100,000 visitors during the 15-day seasonal run. Organizers have entertainment scheduled each evening, with performers ranging from traditional eisa and taiko drummers and diverse styles of music. Folk performances and public Christmas activities feature something special each evening. Fireworks are scheduled for Dec. 24 starting 9:30 p.m.
New Year¹s Eve will feature a countdown concert, followed by fireworks at 0:30 a.m. Elsewhere, from the Southeast Botanical Gardens near Kadena Air Base in Central Okinawa to Gyokusendo in the south, the accent is on lights. Bright lights. Lots of lights. At Gyokusendo, the holiday extravaganza runs daily, with accent on the limestone cave at Japan¹s third largest cave complex. Cameras are really a ³must² for these visits, not only for the lights, but for entertainment being offered by very talented local groups. Don¹t forget extra batteries and memory sticks for the digital cameras. The weather is chilly, and winds often brisk, so dress warmly. Take Okinawa Expressway to south. Instead of getting off at Naha, turn left where the sign points to Nishihara JTC. Continue to the end of the road, then turn left. Follow the signs to Peace Memorial Park. 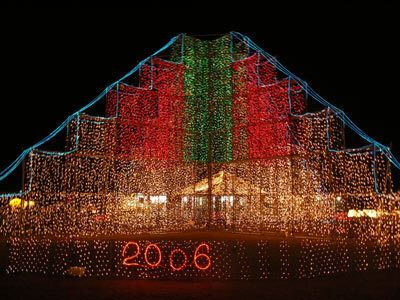 Admission to the light display area of the park is ¥200. Plenty of parking is available near the park, but expect to walk a bit to the park.